With your hosts… Raf Nicholson and Syd Egan! Luff might have faced an understrength Meakins side with an average age of just 16, but you can only play what they put in front of you, and her towering performance showed a player truly in command of the crease and her game, both physically and mentally. Were we witnessing the coming-of-age of the next-but-one England captain? You read it here first! Paige Scholfield is dismissed LBW for Daisy Gardner’s hat-trick! Heather Knight might have put Sussex on the back foot with her 162* but it was Daisy Gardner who broke them, dismissing England Academy batsman Georgia Adams and Paige Scholfield, bisected by the wicket of a certain Sarah Taylor – bowled for a golden duck – as the Berkshire Bullet took her first ever hat-trick in 10 years at the top level of the women’s county game. Canterbury is approximately 265 miles from Manchester, but that didn’t stop the girls from Didsbury WCC making the trip down the M6 for all four days of the Ashes Test, plus the Chelmsford and Hove Twenty20s. Complete with England flag, a special song devoted to Lancashire’s Kate Cross, and an inflatable giraffe with its own arm bands, they were impossible to miss – and why would you want to? 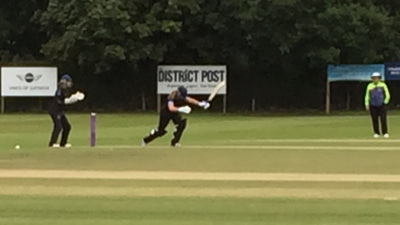 CRICKETher for one are looking forward to seeing the #DidsburyBarmyArmy again in 2016! While England fans might have hoped for a different result, there’s no doubt that the broadcasting of the entire Ashes series added to the excitement of the summer. The pinnacle was the live ball-by-ball coverage of Canterbury, as Sky made history by becoming the first ever broadcaster to show a women’s Test match from beginning to end in its entirety. Hats off to them for bringing women’s Test cricket to a bigger audience. County T20 triple-headers can be long days, but Surrey seemed just a little too keen to get home on this occasion, as in their last match of the day at Merchant Taylors’ back in August they collapsed to 25 all out in the space of 13 overs. CRICKETher were there to watch as Aussie quick Julie Hunter ripped through the Surrey top-order, who barely troubled the scorers. It later transpired to be the lowest total a side has ever made in the competition. Toe-curling stuff. Lords might traditionally have its bell to signal the start of play, but everyone knows that at an England Women’s Test – from Wormsley, to the WACA, to everywhere in-between – the day doesn’t really begin until “Big G” – our one-man Barmy Army – has sung Jerusalem; reminding the players that they aren’t just playing Test cricket… they’re playing Test cricket for England. Despite a successful comeback for Sussex – she was the leading wicket-taker in county cricket in 2015, with 31 victims and a best of 5-33 – 2015 was the year Holly decided to move on; taking a management role at the ICC in Dubai and saying farewell to a playing career in which she had basically achieved everything before the age of 20 – Ashes winner (in 2005), World Cup winner (2009) and World T20 winner (also 2009). Holly will go down in history as the youngest person (male or female) ever to play Test cricket for England – a record which will probably never be broken now the women’s game has entered the professional era – and more importantly she’ll go down in our hearts as one of the most loved players of our era. So long “Trolley”… and thanks for all the wickets! The sad death of Jimmy Hill, described by the BBC as “one of English football’s most influential figures”, was announced today. Hill will no doubt be remembered for his football punditry, especially on Match of the Day, as well as his reign as chairman of the Professional Footballers’ Association. Not many will remember him for his relationship with women’s cricket. But I will. “We were a cricketing family. My father often took me to see Fulham. My stepbrother, Wally, played football and cricket… My step-sister, Irene, played cricket for England. They were quite a bit older than me and they dragged me around to watch them. Irene Panton never actually played a Test for England, but she certainly played at the highest level in the early organised years of the sport – the Women’s Cricket Association was set up in 1926, five years after Irene’s club, Redoubtables, formed. Sadly she was killed in a motorcycle accident in the late 1930s. I also remember her friend Joyce Wawman… ‘Panton’ and ‘Wawman’ used to bring a small boy to our matches who may have been the brother of either of them, ie you. Thank you for your letter following ‘Roots’. Forgive my late reply… I’m certain I was the young boy in the photograph. Joyce Wawman was a kind of cousin who lived with us and who continued to take me around even after Irene’s death. I remember your name well and Sylvia Swinburne too… Thank you for writing and do have a very happy new year. Sadly the correspondence ended there. I like to think that perhaps Hill did, though, attend another Redoubtables match or two after his trip down memory lane. So there you have it. Jimmy Hill, 1928-2015: football pundit, player, chairman, manager and analyser…and friend of women’s cricket. OPINION: Should WBBL & WNCL Be Merged? Whether or not you are the biggest fan of football, it’s hard to argue with its commercial success; and an important facet of this is the loyalty of fans to “their” team – a bond which quite literally spans generations: my son supports Arsenal because I do… and I do because my father does… and he does because his father did – the very idea of supporting anyone else is anathema! This partly explains the massive (by domestic women’s cricket standards) crowds at the WBBL – several games have recorded over 1,000 spectators, which is probably more than the entire 2015 Women’s County Championship combined! Great marketing has helped, but the biggest factor is almost certainly people going to watch a team to which they already have loyalties via the (M)BBL. So the answer to further growing women’s cricket in Australia – especially the 50 Over game – seems clear: get the same teams playing in the WNCL – giving the fans set of teams to follow and the media one set of teams to cover, with allegiances already embedded in the public consciousness via The Other Game. Could a “merger” happen, allowing the WBBL teams to compete for the WNCL? Legally, the answer is almost-certainly yes – Cricket Australia has been pretty canny in making sure that it “owns” the whole caboodle; so there wouldn’t appear to be any major obstacles, apart from perhaps the argument that 8 teams is one team too many, especially once (if?) you take the international stars out of WNCL. So it’s good for the fans… it’s good for the players… and it helps the media to build “the story”. It’s The Future™… and as we’ve seen with WBBL, Cricket Australia do The Future™ rather well – so bring it on! @WomensCricBlog @ECB_cricket why is it our business what contracts are worth ? Going to tell us what you make ? Does this really matter? Yes and no! We certainly don’t have a problem with the concept of “part time” contracts, which require players to have “second jobs” as well to support themselves – this very web site is run and financed on just such a basis. However we keep being told that England’s women cricketers are “full-time professionals”; and yet it is hard to be a “full-time professional” if your “full-time professional” job pays less than a full-time living wage. So are the 19 really “full time professionals”? Until we know how much the T3 contracts are worth, the answer is that we genuinely don’t know… and that’s why it was a legitimate question to ask.